Code for the prototype NIO multiplexed server that I've presented at JavaOne and SD West can be found here, along with the SD West 2008 slides. The code examples from the book are available online here. Ronsoft Technologies, my consulting practice. Basically dormant, since I'm now working full time at Mark Logic. This is the support site for the book Java NIO by Ron Hitchens, published by O'Reilly & Associates. This site hosts the code examples associated with the book and provides other information about the book and the topics it covers. Click on the Pig-Footed Bandicoot to the right to see the book's cover art. I'm speaking at SD West 2009, on March 13th (Friday). I'm doing just one talk this time around. It's another update to my server talks from the last two years, How To Build a Scalable, Multiplexed Server Using NIO, Mark III. This time I'll be concentrating on some sample applications that you can build on top of the NIO multiplexing framework. Slides for this and other presentations can (or will) be found here. Information about accessing the code from my Subversion repository is here. You can find two GUI demo tools that I developed a while back to help visualize the way NIO Buffers and Selectors work. These are ready-to-run JARs, just do 'java -jar bufferdemo.jar' or 'java -jar selectdemo.jar' to run them. No need to set the classpath. On Windows and Mac, if things are setup properly, you can just double-click the icon for the jar file. Click here to download the demos. If you have a question or comment about NIO or any other subject, feel free to contact me: . I'll do my best to get back to you in a timely manner (within reason of course). Note: If you don't hear from me within a few days, try again. Emails from random people (that's you) often get flagged as spam and I don't see them. Also, I've occasionally not been able to reply to a question because the sender's corporate mail system won't let my response through. If you need help with an NIO problem, or anything within my expertise, I can provide consulting services worldwide. Please directly and I'll make the pain go away. Update: I'm now employed full-time, so my availabilty for consulting projects is limited. But I still may be able to help. I'm now working full-time at Mark Logic Corporation, which keeps me pretty busy. I haven't been doing much speaking on the subject of NIO lately. If you'd like me to give a talk about NIO, contact me. I spoke at SD West 2008, on March 5th and 6th. I gave two NIO talks this time around. The first is entitled What's New In NIO.2 about the new NIO features that will be available in Java 7 (JSR-203). The second is an update to my server talk from 2007, How To Build a Scalable, Multiplexed Server Using NIO, Mark II. Some improvements have been made to the design with an eye to better leveraging the concurrency APIs and improving worker thread management. Final slides for both presentations as well as the code for the server prototype are available here. There is also information there about accessing the Subversion repository for all the code. I spoke at SD West 2007, on March 23rd at 3:30pm. The topic was How To Build a Scalable, Multiplexed Server Using NIO. The slides can be found here. This talk is based on experiences I've had writing server frameworks using NIO on J2SE 1.4. I updated the code used in the slides to make use of 1.5 features. The codebase upon which the samples are based is 1.4-only and not as cleanly abstracted as I'd like, especially for a use as a teaching example. It is, however, well-tested and production quality. The example code in the slides has been updated to the more modern 1.5 syntax but is not a complete port of the original functionality. But it can still be informative as an example to get you started. If you download the code, please let me know (email address is below). If you're interested in helping complete the port to 1.5 and/or add new features, please get in touch with me to gain commit access to the repository. I spoke at JavaOne 2006, on May 19th at 10:45am, Session TS-1315. The topic was How To Build a Scalable, Multiplexed Server Using NIO. The slides are available on the JavaOne web site. This talk is based on experiences I've had writing server frameworks using NIO on J2SE 1.4. I updated the code used in the slides to make use of 1.5 features. Unfortunately, I was not able to get a working, bundled example app completed in time for JavaOne. The codebase upon which the samples are based is 1.4-only and not as cleanly abstracted as I'd like, especially for a use as a teaching example, so I'm not making it freely available at this time. I intend to finish up and make the improved code available soon - as open source. If you want to know when the code is ready, or maybe help out with it, drop me a line at the email address below. I did a talk with Jason Hunter at JavaOne in San Francisco entitled XQuery For the Java Geek. It was about making use of XQuery from Java. Mark Logic (where Jason and I both work) makes a high performance XML content server based on XQuery. There was nothing about NIO in this talk, but we won a Top-20 award, so it must have been pretty good. The presentation can be found online here. I'll be speaking at JavaPolis in Antwerp, Belgium as a part of the Java@University track on December 3rd. If you plan to attend, please let me know or contact me at the conference, I'd love to hear from European readers. My proposal for an NIO tutorial at the O'Reilly Open Source Conference in Portland was declined (they had one last year and it didn't fit with the theme this year) but I am speaking on the subject of JDO, Wednesday, July 9 at 4:30pm. I plan to attend JavaOne at the Moscone Convention Center in San Francisco, as will several thousand other Java developers. I once worked across the street from Moscone for a year. I will be giving an NIO presentation at the Java Metroplex User Group (JavaMUG) on Wednesday, May 14, 2003 in Dallas, Texas. I lived in Texas for a total of 12 years - Austin, San Antonio and Houston - but never in Dallas. I will be giving an NIO presentation at the Utah Java Users group (UJUG) on Thursday, May 15, 2003 in Salt Lake City. Salt Lake is my hometown - I haven't been back there in several years. 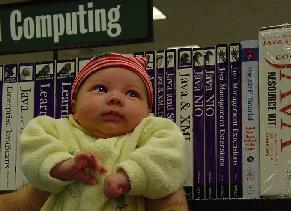 I will be giving an NIO presentation at the San Diego Java Users group (SDJUG) on Tuesday, May 20, 2003 in San Diego. I will be giving another NIO presentation at the Orange County Java User group (OCJUG) on Thursday, May 8, 2003 in Irvine on the UC Irvine campus. I did a presentation there once before. This one will have new demos and more code examples. There will also be a short presentation on Conga. Java NIO will be the featured book on Java Ranch the third week of April. Sign up for a chance to win a free copy of the book. I'll be answering reader's questions online. Forget your tax woes and come on along. I will be attending SDExpo 2003 in Santa Clara. I'm not speaking (Jason Hunter will be presenting a session on NIO) but will be there. I will be giving an NIO presentation at the Los Angeles Java User group (LAJUG) on Tuesday, February 4, 2003 in Pasadena at the offices of Overture. I was originally scheduled for March but moved up to fill in for someone who needed to cancel. Update: The slides, in OpenOffice Impress format, and example code for this presentation are online here. Java NIO has made its way through the distribution chain and is now on the shelves of fine booksellers worldwide. Look for it whereever O'Reilly Java books are sold. Oct 15, 2002: NIO article on onjava.com. I wrote a Top Ten article for O'Reilly's OnJava website. You can jump directly to it by clicking this graphic. Sep 24, 2002:Java NIO has been spotted! I've seen Java NIO on the shelf at MicroCenter near me (Southern California). Still waiting for it to show up at Barnes & Noble. Aug 28, 2002: Java NIO has hit the shelves! I still haven't received my author's copies, and the major online booksellers (see left sidebar) don't show it in stock yet, but I've already received email from people who've bought it. It should be in your local bookestore soon, keep an eye out for it. If you spot it in a bookstore, drop me a line at and let me know where you saw it. I gave a presentation about Java NIO at the Orange County Java User's group on Thursday, June 13 (www.ocjug.org). The slideshow, in OpenOffice Impress format, is online here.